Hats and Rabbits: A Portrait of the Artists? Many, many parents think their kids are geniuses. Some of them are right, some of them are dead-wrong and some of them work hard to deceive themselves that Einstein eats Cinnamon Toast Crunch at their breakfast table: "I know he fails everything, but I believe this happens because he is not challenged enough. So he needs to be in all the top classes, even though he has a test average of 6." No, I am not saying it is the work of a prodigy. It's pretty good, but what do I know? 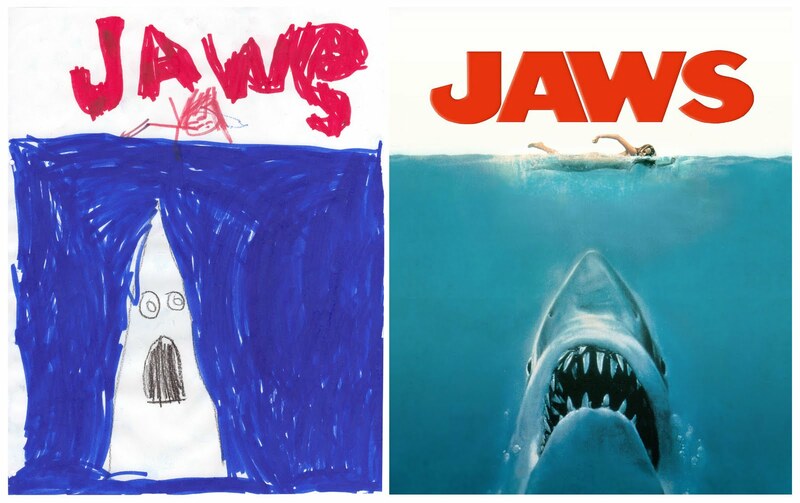 But what struck me is that, for the first time, I see him trying to capture a feeling in his work -- the menace of the shark; the dramatic water proportions. 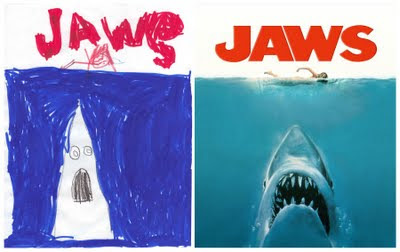 (Actually, if there is any real sign of talent, it might just be the nearly exact proportions he captured from memory . . . doh! Sorry.) It is the first time I have seen him try to go beyond merely depicting. Yeah, it is a copy of something he knows, so that helps. But he needed to recall that feeling. Is this the first evidence of real artistic expression? I must watch carefully . . .
Rich looked behind the box. It was a Goblin!!!!!!!! Rich and Jeff (his dad) were chasing the thing all over town. They saw him crying. "What the heck?" said Jeff. "I want . . . my . . . my . . . my . . ." "Your what?" they both exclaimed. "My riches!" shouted the goblin as he sprung up to get his riches. "Riches?" said Dad, confused. "But, what riches?" said Rich. When they woke up the next morning, they saw gold! But guess who had it . . . "You again," screamed Rich. Zoom! "You pesky goblin!" yelled Rich. They made it end quite violently. "Violence solves nothing," said the goblin. "Shut u-- " but he was off. "Now what," exclaimed Rich. "Fire," whispered Dad. "Fire?" asked Jeff. So they made fake gold, a bow and arrow, and some fire. "Hey, goblin?" asked Rich. "Got some gold . . ." said Rich. "What?" "Now Dad!" Dad shot that burning arrow . . . but it was just a dream. "Phew," sighed Jeff. Whatever it all shows about the two of them in terms of their potential, this is the start of a journey; at least, I think so. I'm glad I recognize it as such. What was, just a month ago, simply that wonderful, unbridled childhood imagination is finally being shaped into something. It has finally become an attempt to get the world (whether the two of them realize it or not) to understand what is going on inside their heads and hearts. Fortunately, I know something of that struggle and I will be here to guide them if they need it. Between you and me, I hope they need it. This was enjoyable to read! I am always amazed at what can come from the same gene pool! I have produced four boys from the same gene pool and the differences among them still amaze me. In the last six years, you have now met three of the four boys. Evan is almost pure creativity in thinking, writing, and music composition. Spencer is mathematical with sketching talents with some musical abilities. Seth is strictly logical with creative thinking. Having just turned ten, Grant is still a work in progress but draws amazingly well. I might be completely inaccurate, but between you and me, the creative ones always need more guidance. Brace yourself for a challenging but fun experience. I'm belted in for the ride. It'll be cool. I don't have kids, but I see what you're getting at here. In November, I sat in a park in Louisiana and narrated the story of Beowulf to my seven-year-old nephew. He responded by racing back to the house to draw the entire cast of characters. I was stunned by some of the details he put into the picture even though I'd never said a word about them: that a king and a hero were likely to carry a sword while a henchman would have only a spear, that Germanic warriors wore bowl-like helmets with straight little nose-guards, etc. I don't know where he got that stuff, but it was a fascinating glimpse into the mind of a kid, and surprising confirmation that the story he'd heard wasn't too different from the story I'd told him. Jeff -- that's fascinating. Maybe I should experiment with my little lab rats. Several years ago, I told them THE ODYSSEY at bed time for about three weeks. They were completely in love with the story, but the results were play-acting, as they were a little young to express themselves in any artistic way. I wonder what would happen if I started the tale again . . .
On another note, your nephew's clear perceptions of the historicity of Beowulf's (or, at least, the later scribe's) time is one heck of a subject for study. The long argument over whether BEOWULF'S value lies more in its impact as an historical document or as a work of literature certainly gets some more fuel from your nephew's seemingly instinctual, accurate, reaction to it in its true form: the oral tradition. Wow -- you really got the gears turning for me . . .
Gina -- time will, indeed, tell, but I have a pretty good idea what the story will be. Here's hopin'. Your nine-year-old writes better dialogue than I do! Ha. It sure is -- I just can't wait to see how far it acautly does develop . . .
Wow -- yes it did drop that really interesting comment, Jeff -- in fact, I left a long reply to it, covering such hefty literary topics as the oral tradition and my own experiences with telling THE ODYSSEY to my kids, that also got lost . . .
Blogger was down most of the day yesterday -- didn't think if would affect comments, though. That's frustrating. My apologies. No worries! It's amazing, though, what one Blogger outage can do to tens of thousands of conversations.